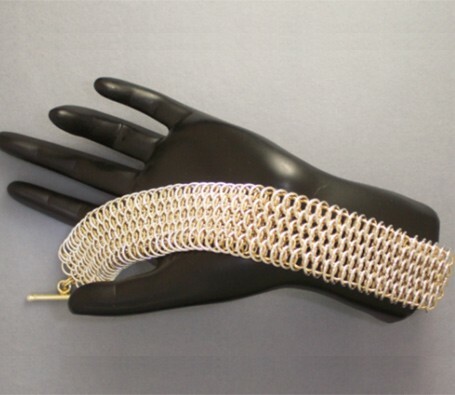 The Dragonscale Bracelet feels like a large cuff bracelet on the wrist. This is a time consuming bracelet to make, but the end result is very rewarding and will last a lifetime. The picture illustrates a large bracelet with yellow gold filled rings on the inside and sterling silver rings on the outside. You could also make the reverse, with the yellow gold filled rings on the outside and the sterling silver rings on the inside. The large bracelet is approximately 1 inch across and there is a small bracelet variation that is 3/4 of an inch across. This design was created by Rebeca Mojica. The clasp is not included in the kit.